Melt the butter in the pan. Dice the red onion and garlic and fry off in the butter until soft. Add the flour and stir to a thick paste. Cook the roux for a minute. Stir in the cold milk to make a white sauce that will thicken when the milk warms up. Season to taste with the lemon juice, nutmeg, salt and pepper. Allow to simmer for a couple of minutes while you cook the pasta in plenty of boiling water with some salt until almost cooked. Drain the pasta and stir into the sauce. Keep warm. Meanwhile, boil the eggs in plenty of boiling water for 8 minutes. Refresh briefly under cold running water and peel. Toast the pine nuts in a dry pan until coloured. Remove the wooden end from the green asparagus. Brush with some oil and grill until hot and half cooked. Position the asparagus on the plate. Spoon the pasta and white sauce on top. 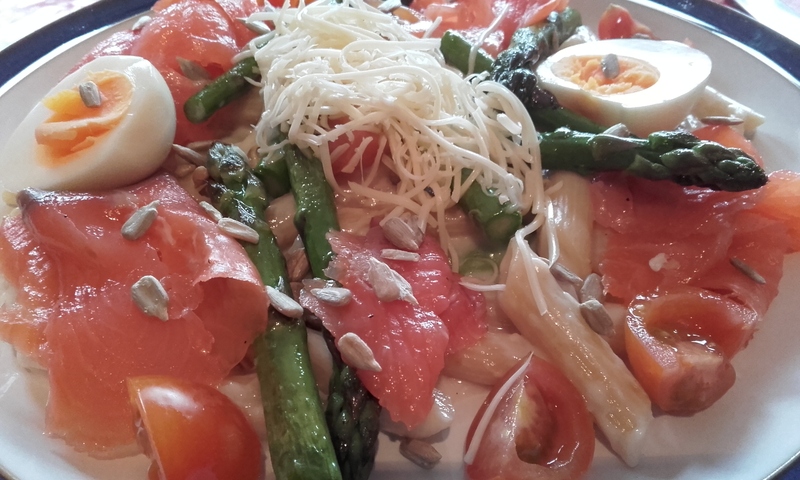 Garnish with the cooked egg, toasted pine nuts, smoked salmon and cherry tomatoes. Green asparagus don’t need to be peeled. Just remove the wooden end. The white sauce is a classic béchamel sauce. If desired, add some dill. Substitute the smoked salmon with a grilled salmon fillet or grilled ham.